Kenny Witte, a worker with Seedorff Masonary, cuts bricks for the exterior of the lofts on Fourth Avenue. The Fourth Avenue Lofts project began in October 2015 when the proposal was presented to city officials. The Fourth Avenue Lofts complex aims to be 100 percent accessible for people with disabilities and will also be environmentally green. 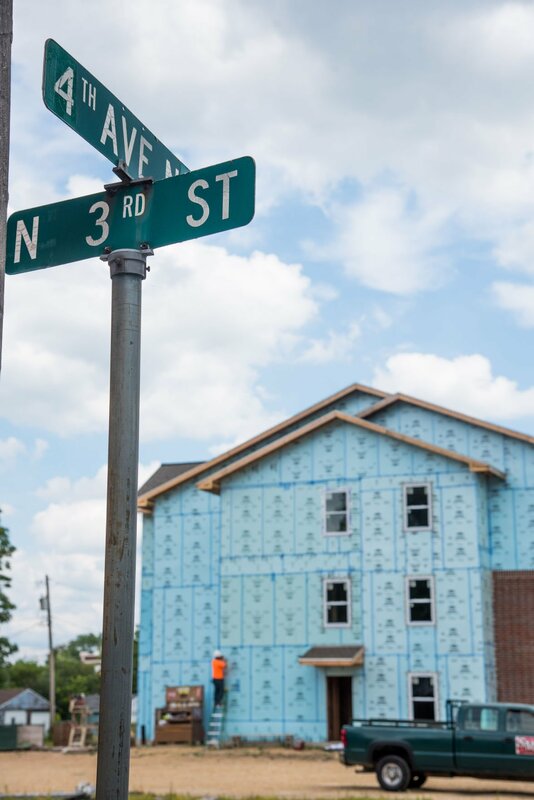 CLINTON — The year 2017 saw a new housing development break ground on Fourth Avenue North. By mid-summer, representatives from Ohio-based Miller Valentine Group were looking ahead to filling the units and completing the project. Planning for the Fourth Avenue Lofts project began in October 2015 when the proposal was presented to city officials. In 2016, the Iowa Finance Authority awarded the Miller Valentine Group $700,000 in tax credits for the project. In fall 2016, the City Council approved a single lot of 1.586 acres, which runs from 214 to 238 Fourth Ave. North, where the housing development could be built. An official development agreement was approved in October 2016 and ground broke on the facility in January 2017. The complex, which is estimated to cost $9 million, will hold 48 residential units once completed. Forty-three of the units will be designated for low-to-moderate income housing. The facility is expected to include many amenities for residents, including a community room with a theater, a fitness room, business rooms and an outdoor recreation area. Pete Schwiegeraht, Midwest Regional Developer with Miller Valentine Group, says that such amenities are typical of the housing complexes built by the company. He says the company strives to provide not only housing, but opportunities for residents to relax, be entertained and socialize. The official development agreement states that the project must be completed by Oct. 31, 2018, but in July, Schwiegeraht said the project was moving right along and should be finished by the end of 2017. "We're excited to get the leasing process started," Schwiegeraht said. "Marketing normally starts four to six months before completion. It will probably begin by the end of summer." The Fourth Avenue Lofts complex aims to be 100 percent accessible for people with disabilities and will also be environmentally green. Schwiegeraht says that Miller Valentine Group builds complexes in accordance with the 2015 criteria set by Enterprise Green Communities. The 2015 criteria page on the Enterprise Green Communities website lists eight categories that both mandatory and optional criteria are grouped into. Every development seeking certification must achieve a set number of optional points in addition to meeting mandatory criteria. The categories include location and neighborhood fabric, site improvements, water conservation, energy efficiency, materials, healthy living environment, operations, maintenance and resident engagement and integrative design. These criteria establish a guide for building properties that are not only environmentally green in design, but also provide ways to help residents practice green habits outside of the home, such as walking or biking to nearby businesses and amenities instead of driving. Other criteria for new complexes include certifying each unit through the Energy Star New Homes program, following guidelines for high efficiency lighting and using moisture preventative surfaces to prevent mold. Miller Valentine Group already has several complexes throughout Iowa and is now looking to the eastern portion of the state. Complexes in Des Moines, Keokuk, Centerville and Newton will soon be joined by the Fourth Avenue Lofts building as well as another project in Muscatine. Miller Valentine Group is one of the largest multi-housing developers in the country. The group currently operates in 11 states. In September 2016, Zach Karches, a financial analyst for the Ohio-based group, told the Clinton Herald that Miller Valentine has more than 100 tax-credit properties in service throughout the country.